If you haven't had your fill of business jargon for the day, take a gander at the press release below. MINNEAPOLIS – April 14, 2011 – Today, at a company-held meeting for the financial community, Best Buy Co., Inc. (NYSE: BBY) intends to outline its strategic growth plans for its domestic and international businesses. Senior executives are expected to review the initiatives that will support the company’s strategic priorities, which focus on accessing a larger market, profitable new growth opportunities, and structural opportunities. Access to a larger market. Best Buy foresees significant incremental opportunity in accessories, content, connections and services. The total current industry opportunity, estimated today at $420 billion, is more than 2.5x the traditional consumer electronics hardware market. Capturing new growth opportunities in key categories and channels. Significantly expanding Best Buy’s online presence in the United States, with a goal of doubling the current $2 billion online business within 3 to 5 years. Scaling Best Buy Mobile as part of the company’s multi-channel strategy with an estimated total of 600 to 800 Best Buy Mobile stand-alone stores in the United States within five years. Investing in proven international businesses such as Five Star, our profitable Chinese brand in the Best Buy family. Best Buy expects to grow to 400 to 500 Five Star stores in the next five years. The company believes it can more than double its revenues in China to $4 billion within five years. Funding growth efforts through structural opportunities. Maximizing the pricing and assortment across Best Buy’s U.S. channels to drive higher conversion and overall price impression for the brand. Driving returns in Best Buy’s U.S. stores through specific actions to improve store productivity while increasing points of presence, including an anticipated 10 percent reduction in US “big box” store square footage over the next three to five years, resulting in expected annual savings of $70 million to $80 million, when fully realized. 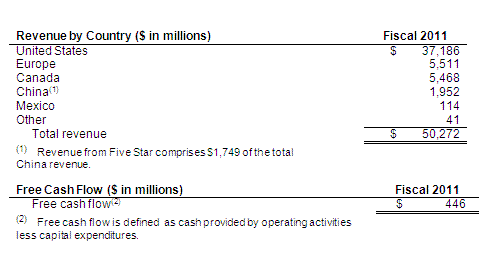 Anticipated free cash flow of $2 billion to $2.5 billion for fiscal 2012. Confirmation of current share repurchase activity and a goal of fully utilizing its existing share repurchase authorization of $1.3 billion in fiscal 2012, subject to market conditions and other factors. The Best Buy Investor and Analyst Day will be held today, Thursday, April 14, 2011, at the company’s corporate campus in Richfield, Minn. The conference will begin at 10:00 am CT and will be available in its entirety through a live webcast and replay on www.bby.com. Presentation materials also will be publicly available on the Investor Relations page of www.bby.com.